Plantar fasciitis is a common, painful foot condition. Patients, and sometimes doctors often confuse the terms plantar fasciitis and heel spurs. 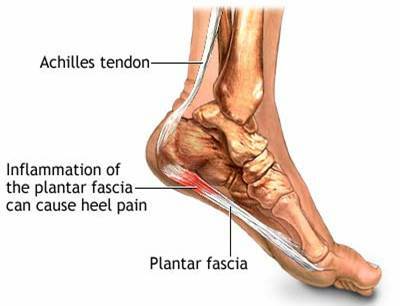 Plantar fasciitis refers to the syndrome of inflammation of the band of tissue that runs from the heel along the arch of the foot; a heel spur is a hook of bone that can form on the heel bone (calcaneus). About 70% of patients with plantar fasciitis have been noted to have a heel spur that can be seen on X-Ray. Plantar fasciitis is most often seen in middle-aged men and women, but can be found in all age groups. Plantar fasciitis is diagnosed with the classic symptoms of pain well localized over the heel area of the bottom of the foot. Often the pain from plantar fasciitis is most severe when you first stand on your feet in the morning. Pain often subsides quite quickly, but then returns after prolonged standing or walking. Plantar fasciitis is sometimes, but not always, associated with a rapid gain of weight. Plantar fasciitis is also sometimes seen in recreational athletes, especially runners. In these athletes, it is thought that the repetitive nature of the sports causes the damage to the fibrous tissue that forms the arch of the foot. Over-pronation (flat feet) is the leading cause of plantar fasciitis. Over-pronation occurs in the walking process, when a person's arch collapses upon weight bearing, causing the plantar fascia to be stretched away from the heel bone. With Plantar Fasciitis, the bottom of your foot usually hurts near the inside of the foot where the heel and arch meet. The pain is often acute either first thing in the morning or after a long rest, because while resting the plantar fascia contracts back to its original shape. As the day progresses and the plantar fascia continues to be stretched, the pain often subsides. You're more likely to get the condition if you're a woman, if you're overweight, or if you have a job that requires a lot of walking or standing on hard surfaces. You're also at risk if you walk or run for exercise, especially if you have tight calf muscles that limit how far you can flex your ankles. People with very flat feet or very high arches are also more prone to plantar fasciitis. The condition starts gradually with mild pain at the heel bone often referred to as a stone bruise. You're more likely to feel it after (not during) exercise. The pain classically occurs again after arising from a midday lunch break. If you don't treat plantar fasciitis, it may become a chronic condition. You may not be able to keep up your level of activity and you may also develop symptoms of foot, knee, hip and back problems because of the way plantar fasciitis changes the way you walk. 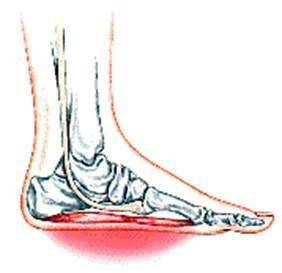 Could something other than plantar fasciitis cause this pain? Plantar fasciitis can be confused with a condition called tarsal tunnel syndrome. 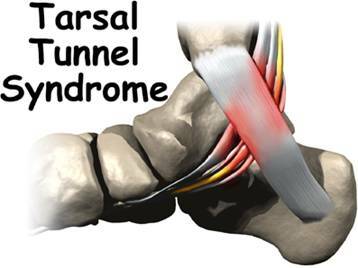 In tarsal tunnel syndrome, an important nerve in the foot, the tibial nerve, is trapped and pinched as it passes through the tarsal tunnel, a condition analogous to carpal tunnel syndrome in the wrist. This may cause symptoms similar to the pain of a plantar fasciitis. There are also other less common problems such as nerve entrapments, stress fractures, and fat pad necrosis, all of which can cause foot pain. 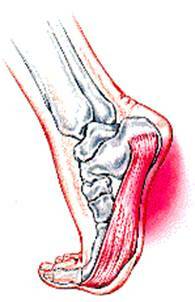 Finally, several rheumatologic conditions can cause heel pain. These syndromes such as Reiter's syndrome and ankylosing spondylitis can cause heel pain similar to plantar fasciitis. If your symptoms are not typical for plantar fasciitis, or if your symptoms do not resolve with treatment, your doctor will consider these possible diagnoses. The key for the proper treatment of plantar fasciitis is determining what is causing the excessive stretching of the plantar fascia. When the cause is over-pronation (flat feet), an orthotic with rearfoot posting and longitudinal arch support is an effective device to reduce the over-pronation and allow the condition to heal. If you have usually high arches, which can also lead to plantar fasciitis, cushion the heel, absorb shock and wear proper footwear that will accommodate and comfort the foot. Other common treatments include stretching exercises, plantar fasciitis night splints, wearing shoes that have a cushioned heel to absorb shock, and elevating the heel with the use of a heel cradle or heel cup. Heel cradles and heel cups provide extra comfort, cushion the heel, and reduce the amount of shock and shear forces placed during everyday activities. Every time your foot strikes the ground, the plantar fascia is stretched. You can reduce the strain and stress on the plantar fascia by following these simple instructions: Avoid running on hard or uneven ground, lose any excess weight, and wear shoes and orthotics that support your arch to prevent over-stretching of the plantar fascia. Begin an exercise program slowly. Don’t go too far or too fast. Buy good shoes and replace them regularly. Stretch each foot and Achilles tendon both before and after exercise. Avoid uneven walking surfaces or stepping on rocks. Avoid going barefoot on hard surfaces. Vary the incline on a treadmill. Nobody walks uphill all the time. Wear stiff soled shoes when gardening or working on a ladder. If it hurts, stop. Don’t try to work through the pain. Get professional help. Icky agonies require medicine, or surgery. Toenail fungus. The nail becomes thicker, discolored, often with crumbly yellow debris under it. Usually it starts with the big toes, then spreads. The treatment varies a great deal, often depending on whether there is pain or desire to correct the appearance. There is a topical medication available by prescription that has to be used for about 42 to 48 weeks. Its success rate is not good, about 20%, but there are no side effects. There are two prescription medications in pill form that are successful about 50% to 70% of the time, but they can be costly and may interfere with liver function. Although they are generally safe, you want to have blood tests and be careful about combining them with other medication or alcohol. Plantar warts. Plantar jus means the warts are on the bottom of the foot. Many types of viruses cause them. You see only the tip of the iceberg; a vascular system of tentacles is often growing underneath the skin. The first thing to do is to get a proper diagnosis. Treatment can involve burning them out with an electric needle; freezing them with cryotherapy; cutting them out surgically; or most commonly, removing them with repeated chemical treatments. Chemicals leave the least amount of scarring. 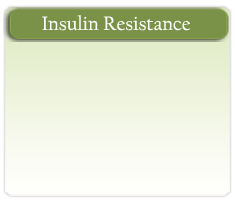 Insulin resistance is a silent condition that increases the chances of developing diabetes and heart disease. Metabolic syndrome is the name for a group of risk factors linked to overweight and obesity. Polycystic (pah-lee-SIS-tik) ovary syndrome (PCOS) is a health problem that can affect a woman's menstrual cycle. Obesity is a serious health problem. Two out of three American adults are overweight or obese.